In a Wednesday letter to the Wellesley College community, President H. Kim Bottomly, Provost Andy Shennan, and Interim Dean of Students Adele Wolfson announced plans to enhance and add to existing spaces for multicultural programming and to create a network of multicultural spaces on campus. 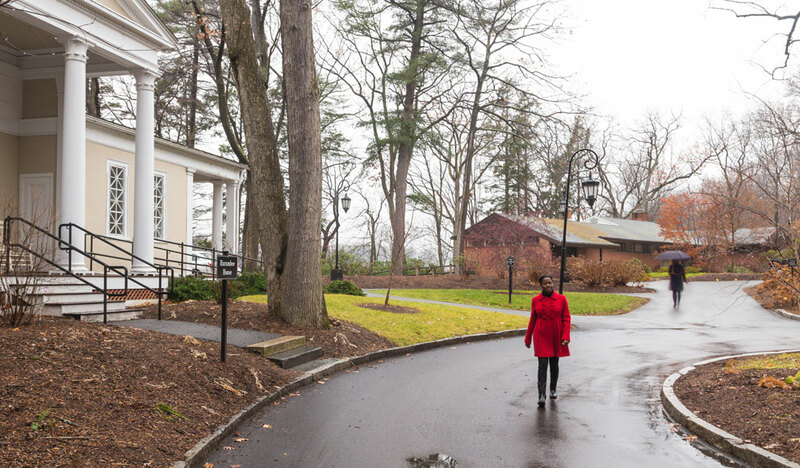 "Wellesley is committed to building a living and learning environment in which each student can thrive intellectually, socially, and emotionally. Creating a network of multicultural spaces on campus will allow students to collaborate with and draw strength from those with whom they share a common identity while, at the same time, promoting intercultural dialogue and connection among all members of the Wellesley community," wrote President Bottomly, Provost Shennan, and Dean Wolfson. The College will convert Acorns, a mid-century modern building situated on Lake Waban and the former residence of the Dean of Students, into a center that will provide: substantial space for events and meetings; offices for the advisors to students of Asian descent, Latina students, and LBGTQ students; as well as living, kitchen facilities and study space. Harambee House, which has served students of African descent since 1970, will receive repairs and upgrades to the lower level. Work will begin immediately after the holidays and is scheduled to be completed in 2016. The College is asking students and the cultural advisors to lead conversations on how they envision Acorns can serve their needs, how it can be best utilized for the kinds of programming likely to occur, and how the various groups can work together to create an inclusive and functional network of spaces. Wellesley students have long raised concerns about the shortage of multicultural space on campus, concerns reiterated by the President’s Commission on Ethnicity, Race, and Equity (CERE), a current committee that was created last January. The plans announced Wednesday have been informed by the work of CERE as well as previous committees, including the Initiative for Diversity and Inclusion for Students. At a meeting yesterday, Provost Shennan and Dean Wolfson shared the news with some 50 students, cultural advisors, and campus leaders before the College made its official announcement. The meeting also included a productive question and answer session in which students expressed their thoughts and concerns. In response to input from the meeting, the College has scheduled an open house at Acorns on Friday, December 4, from 12 to 2 pm, and the Multicultural Affairs Coordinator, Ananya Ghemawat '17, said she would help organize future student conversations about programming and how the space might be used. Ghemawat said, "I'm really pleased and happy that the College is honoring its commitment to multiculturalism on campus. I'm glad they're realizing how integral this is to everyone, that it will benefit us all." Natalie Mendenhall '17, who also attended the meeting, expressed similar sentiments. "I think it's a beginning, and I think, with all of the great minds here, that [the College’s plan] can be a collaborative and wonderful effort between the administration and the cultural org’s." She added, "This is much needed." Cassandra Flores-Montano '16, a student member of the CERE, said the "cry for an adequate space has been going on for a really, really long time. So of course, it's exciting that's it happening; [but] it’s frustrating that it's taken so long." Flores-Montano said she hoped that the initial excitement didn't overshadow the fact that there are "a lot of very serious concerns about the space." Acknowledging that the plans announced Wednesday were a first step, Provost Shennan pledged to work with students to address their concerns. He said, "They raised thoughtful questions and insightful comments, which illustrated that our work is just beginning. We must collaborate with all our students to make the changes necessary to fostering an inclusive environment." The proposed network of spaces will include Slater International Center and Continuing Education (CE) House as well as Acorns and Harambee, and is expected to "inspire innovative programming and produce a synergy beneficial to the entire community" read the announcement. According to Tracey Cameron, assistant dean of the Office of Intercultural Education and Director of Harambee House, the plan "reaffirms our commitment to providing a diverse and inclusive environment for students." She said, "For far too long there has been a need for other marginalized groups on campus to have a safe space where students of shared cultures can be with one another and have programs together. While not a silver bullet by any means, I believe that this is a step in the right direction."